On one of my visits to California before moving here, I played Penmar By the Sea, a quaint, wooded nine-hole muni course in Venice. The thing I remember most about that round is standing on the tee box at the third hole and hearing one of our playing partners emerge from a porta-potty swearing and screaming like a lunatic. His anger was directed at a squirrel that had climbed atop his golf bag. After the squirrel had been chased off, I learned about the notorious reputation of the Penmar squirrels for golf bag vandalism. It turns out that, over the years, the squirrels have come to associate golf bag pockets with food and will slash a golf bag to ribbons in seconds in the hopes of scoring, say, a granola bar. Having previously only played golf mainly in the Midwest, I was totally unaccustomed to such animal antics on the golf course. The closest I’d ever come to such drama was once being chased by a hormonal Canadian goose. Animal interaction in the Midwest is mostly the desired type, such as catching a deer crossing the fairway or spying a wild turkey in the brush. Turns out the crow had snatched the snack from his cart on the first tee – and was now following him in the hopes of scoring more. Some animals scavenge, while others seemingly make a living by staking out a hole. Shortly after I moved out, I played the Navy Course in Seal Beach a few times. Each time, a squirrel – I’m assuming the same squirrel – absconded with something from the group. The most memorable was when I was on the green and noticed my playing partner’s son gesturing in an agitated fashion toward his cart. The squirrel had possession of his gluten-free sandwich, and the kid was understandably upset. By the time the boy reached the cart, the squirrel was long gone – or so we thought. When we reached the next tee box, I looked back and there was the squirrel, sitting behind a tree eating the sandwich. Remarkably, he had skillfully taken it out of the bag. 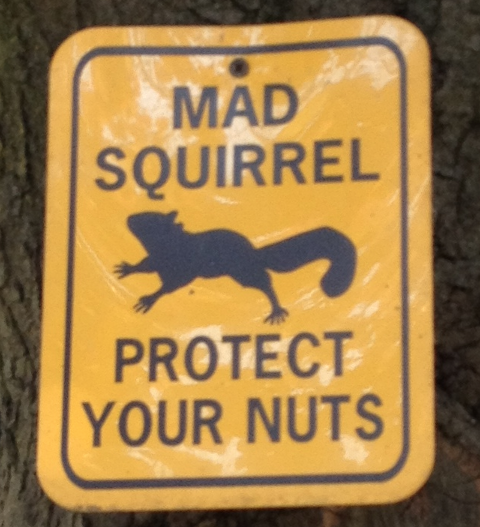 On that same hole, I once returned to my cart to experience a squirrel whoosing between my legs. Some animals adopt a gentler approach. While playing San Juan Hills, my group had two quacking ducks follow us from one tee box to the next, seemingly begging for chips. Out here, I’m sure these stories can go on for days and I’ve hardly seen the wildest California has to offer. Or maybe these are the least of the problems when you play courses that routinely have signs posted warning of rattlesnakes and mountain lions. Or your golf bag. Or your potato chips. Or sandwich. Or PowerBar. Anyway, newcomers to California golf, consider yourself warned. This entry was tagged Golf, Golf Humor, squirrel. Bookmark the permalink.